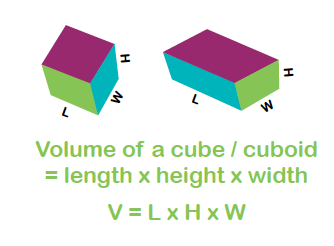 Volume and capacity are important concepts in primary maths, and your child will start learning about the amount of 3D space occupied by an object in Key Stage 1. Find out how you can support their learning at home, plus the relevant mathematical formulae, with our parents' guide to volume. Volume is the amount of 3D space an object occupies or takes up. What is the difference between volume and capacity? In Key Stage 1 (Years 1 and 2) and lower Key Stage 2 (Years 3 and 4) the terms volume and capacity are used inter-changeably. The difference is very subtle (and taught in upper Key Stage 2, Years 5 and 6), but capacity is the total amount of fluid that can be contained in a container and the word we use when we are measuring liquids. What are primary-school children taught about volume, and at what age? In Y1 children are taught to compare, describe and solve practical problems involving capacity/volume. For example, they will experiment/play with jugs, containers, cups and bottles in a water tray and discuss terms such as full/empty, more than, less than and half full. They will investigate questions such as how many cups of water will fill the bottle and which container holds the most water. They will begin to measure volume in standard units, such as litres/millilitres, using a measuring cylinder with marked measurements on the side. In Y2 children will begin to choose and use appropriate units to measure volume/capacity, for example using millilitres to measure medicine and litres to measure petrol. They will become more accurate at reading measurements of capacity/volume. Children will also be taught to compare and order volume and capacity using the terms greater than, less than, equal too and the corresponding symbols > < = (for example, 350ml < 550ml). Children solve problems by adding and subtracting volume/capacity in litres and millilitres (for example: 350ml + 550ml = 900ml). They learn to convert between measurements (for example 3500ml = 3l and 500 ml). In Y6 children learn to use formulae to calculate the volume of a shape in cubic units. For example, if you take a cuboid such as a tissue box you can measure its width, height and depth and use these measurements to calculate the volume of the shape (how much 3D space it is occupying) by applying the formula. With younger children in Year 1 and 2 you can provide them with jugs, containers, plastic cups and bottles to experiment with in a water tray, sink or the bath at bath time. Encourage them to use vocabulary such as full, empty, more than, less than, half and investigate which containers hold the most water. If using a water tray you could add a small amount of food colouring to the water so it is easier to see the amount of liquid it contains. Children in Years 3 and 4 can practice reading measurements on jugs when cooking and become aware of capacity when shopping. In Year 5 children could use sugar cubes to build structures and discuss the volume.